Hi. Just yesterday my server expiration date came to pass but I've learned how to deal with the attacks. The first rules I applied made so my server would never go down when under attack but we still experienced a lot of lag when it was under. That is, until I blocked most of the IP's doing it. The list of IPS under were blocked over 3.000.000 times in the last 10-11 days. I hope the list helps. If you need rules to batch, lemme know. I'd like to request activation for diogo.weed for my idiot friend doesnt know how to do it. So, I just wanted to ask for something I think should be really easy. 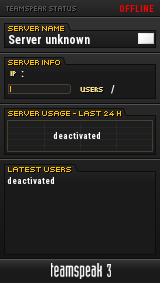 On the sitrep, add a different color to the name of the message author if its the logged in user. Ofc I dont expect to type a message here (forum) and see it highlighted when reading on the application. This way its much easier to find where one person last left the shoutbox. I will upload a ton more, once I have the time/patience to do so. I'm pretty sure I enabled all the ports and even tried to open the server with firewall down and still occurs the same problem. With that in mind, I dont think it's firewall related. What else could it be? Server was fine for a few days and no changes were made to the system itself. Im puzzled.